Willkommen …im Händlerbereich unserer Website! Versandkosten richten sich nach dem Volumen der Bestellung. Versandkosten außerhalb Deutschlands: Bitte fordern Sie unsere Versandkosten-Preisliste an! Manche Artikel haben höhere Versandkosten, da sie über dem max. Gurtmaß liegen oder direkt vom Hersteller versendet werden. Bitte schlagen Sie hierfür in Ihrer Preisliste nach, diese Artikel sind mit SV (für Sonderversand) gekennzeichnet bzw. sind hier die Versandkosten eingetragen. Welcome …in your retailer account on our Website! Delivery: Ex Works Germany (EXW) via parcel service DPD. Transport costs are depending on the weight of each parcel or you live in a country where we have a fixed parcel price from 1 kg – 31,5 kg. Please ask for our currently freight costs pdf file. We send huge amounts via our forwarder. Transport costs are depending on volume of shipment. Of course, you could pick-up goods by your forwarder. Some products have different delivery costs (to large for DPD or dropshipping directly from our supplier). Please take a look at your price list. These products are marked with SD for special delivery or you'll see their delivery costs. 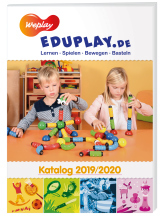 please call +49 (0) 9561 23 99 3 0 or send an E-Mail to bestellung@eduplay.de !